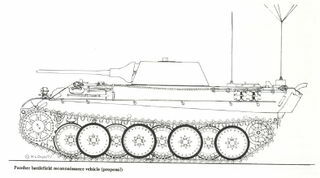 A project for a heavy reconnaissance vehicle based on the Panther tank. The use of the hull and chassis of the existing tank would have significantly facilitated the mass production of the new vehicles; a smaller turret would have decreased the weight and improved the maneuverability of the vehicle. However, the project was discontinued at a development stage. Also known as "Awful Panther". 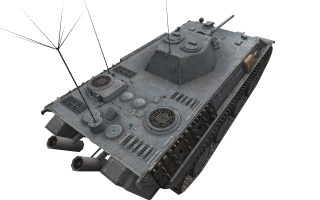 The Aufklärungspanzer Panther was replaced by Spähpanzer SP I C. in patch 0.9.9 due to the fact that it had completely different playstyle than the rest of the line. 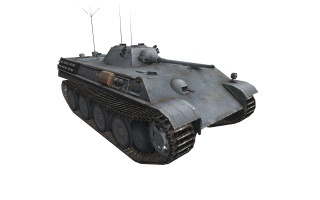 However, WG are currently reworking this vehicle and planned to be released as Tier 8 premium light tank. - Fast acceleration and respectful top speed (despite size) allows for fast relocation to offer support where needed. - Good penetration (with great prem round) for a tier 7 scout. - Good aim time, high shell velocity and amazing accuracy. A blistering ROF (faster than 3 seconds reload with good crew and a rammer) means DPM is high as well. - Good Radio and good view range. - Retains camo bonus while moving. - Can mount 10.5cm howitzer if preferred. 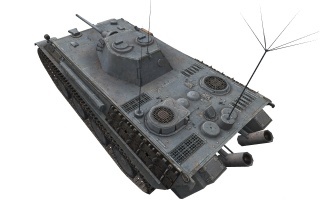 - Thick hull armor for a light tank (Panther hull). Front plate if angled can bounce guns with up to 160mm of pen. Side armor of 50mm avoids triple overmatch from <150mm caliber rounds. - Good for ramming lighter vehicles due to its weight. - High cost of premium shells. - Can be ammo racked from frontal shots. 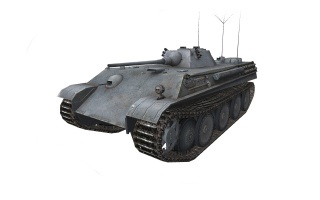 - Very large silhouette, especially for a light tank. - Atrocious stock grind due to weak gun. (Stock, the only way to consistently deal damage is ramming). This page was last modified on 12 December 2017, at 22:32.